The day that many girls had been waiting for finally arrived: Sunday, December 16th. That´s right, we were waiting for this Sunday like rain in the springtime. 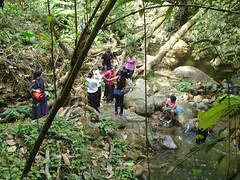 The group of girls of the HMY and some others who joined in, organized a trip of mountain climbing and adventure in a place that is called "7 waterfalls", a two-hour bus ride from Guayaquil. We started the day by attending the 8 a.m. mass in the parish of Loreto (Guayaquil). At 9:30 we were on the bus and on our way to "Los Naranjales", the place where the 7 waterfalls are. 25 girls and 4 sisters were on the trip. After praying the morning offering and the consecration to the Heart of Jesus, we sang some songs, and then decided to watch a movie to finish off the bus ride. We arrived at 12, took out our lunch and at well, very well, before starting the hike. You have to climb up a mountain in order to be able to see all the waterfalls. The higher you climb, the harder it is. 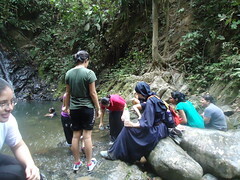 Some people only climb up to the fourth waterfall, but we kept on with the hope of reaching the top. There are a series of ropes attached to the mountain and the rocks to help you climb up and it really is a true mountain climb. Some girls slipped, and it seemed like they were going to fall down the mountain, but nothing can happen if you are really holding on tightly to the rope. We applied this to the spiritual life and to the temptations or falls. In some moments of your life you can slip and fall a little, but you get up immediately if you are holding onto the correct rope, which is Christ. After a two hour climb, we all reached the last waterfall and there we could enjoy a good swim in the pool formed by the water that fell from it. God always rewards our efforts.